Since the introduction of the original case study houses seventy years ago, much has changed in the architectural profession and construction industry. The introduction of digital design and fabrication has revolutionized our capabilities as designers. Case Study House 29 (CSH29) is an investigation into the capacity of digital, parametric design and mass customization. In the 1940’s, the original case study homes were designed to be built and replicated anywhere in the United States, ignoring, unfortunately, site relationships and local climate considerations. While the first case study house in post-war America ushered in the widespread use of steel, plywood, glass, aluminum, resilient materials and open spaces into residential design, the construction of residential structures has changed little over the last seventy years. With labor, material and energy costs continuing to rise, a new residential construction paradigm must be considered. CSH29 does not focus on the duplication of its plan or exterior aesthetics, but rather, proposes new uses of current and emergent technologies. Parametric modeling workflows, coupled with new research into 3D concrete printing being performed at MIT and Loughborough Univesity, and infra-lightweight concrete being developed in Germany makes possible the concept of a unitized, mass-customizable construction methodology. A transportable 3D printer arrives on site, in tandem with a more traditional concrete truck. 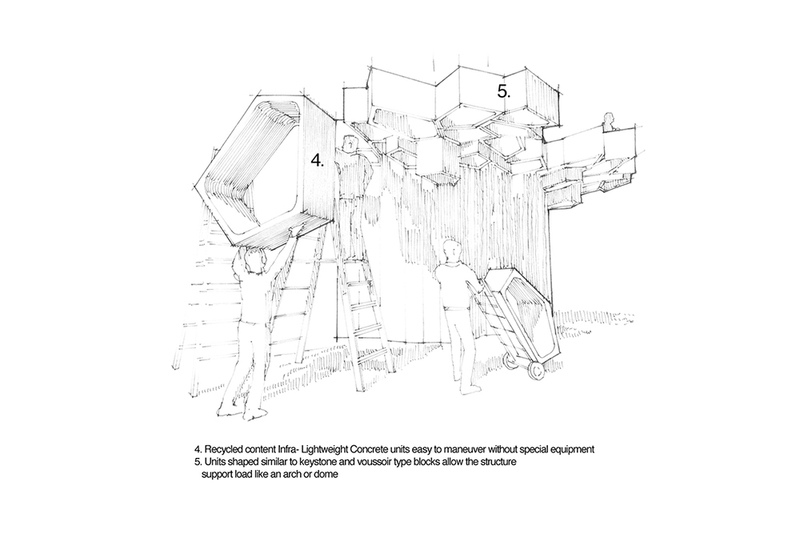 The lightweight concrete units are 3D printed and placed by workers. An RFID tag on the unit is scanned, cataloging its unique location in space and comparing it against the digital model. As site considerations, field conditions and construction tolerances create discrepancies between the digital design and as-built components, the digital model can be altered to ensure subsequent units are modified to rectify inconsistencies, creating a continuous quality-control feedback loop. Case Study House 29 posits a new site-specific, highly customizable housing typology that leverages emergent material technology and construction methodologies.